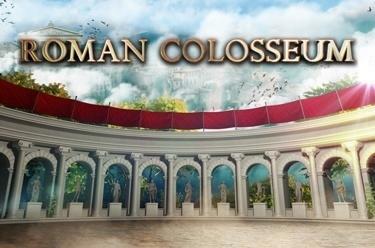 Play Roman Colosseum online for free now! In the slot Roman Colosseum you can compete with the best gladiators in the colosseum on 5 reels with 10 pay lines. The Wild symbol, the gladiator, earns the largest Twist wins for you. 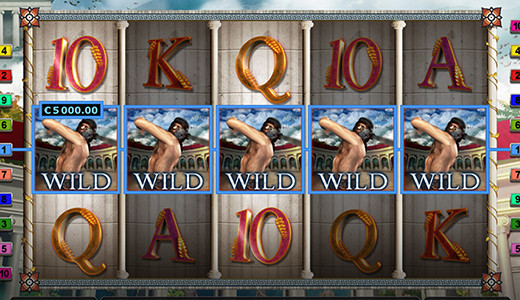 Your aim with Roman Colosseum is to land 5 identical symbols on one of 10 pay lines. All of them run from left to right across the reel set. The most lucrative symbol in the game is the gladiator: As Wild symbol he is not only your closest ally for scoring winnings - he can substitute for any slot symbol except Scatter - but he also doubles any win if he lands as part of a winning combo. If the Scatter symbol, the colosseum, lands 3, 4 or 5 times in any reel position it triggers 16 free games. After at least 3 Scatter symbols have landed the Scatter win is paid out first; subsequently the Scatters turn into Wild symbols and the line win is paid out. Only afterwards the 16 free games start: Here, the Scatter is also a Wild symbol - that means there are 2 Wild symbols in the free games! Just like in the regular game, Wilds pay out double line wins during free games! Although we are in a colosseum where gladiators fight to the death for Twists there is only one sign when it comes to winnings: thumbs up! Because Roman Colosseum not only features a Wild symbol that doubles your line wins but also free games where the Scatter symbol acts as an additional Wild symbol. So, get into the ring where gladiators are eager to compete with you and Twists are eager to make their way to your player account!